Click here to get directions to our waste collection facilities. The Greenville County Sheriff’s Office, Litter Ends Here and residents of Greenville County are teaming up to promote cleaner communities throughout our county. Unsecured loads are the leading cause of unintentional litter, creating serious traffic hazards. 20% of litter found on the road is a direct result of people transporting it without a tarp. Roadside litter debris causes an estimated 25,000 accidents and more than 100 fatalities annually. 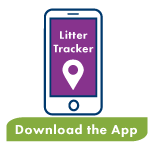 Since February 2017, Litter Ends Here trucks have collected 169,360 lbs. of litter off of the roads in Greenville County. 33,000 lbs. of that litter is a direct result of unsecured loads. Litter Ends Here and the Greenville County Sheriff's Office remind citizens that South Carolina state law mandates the tarping of loads. Please obey the law and do your part to prevent litter in our community.